Great Apologies that it became necessary to cancel this anticipated event. In honor of our 21st Annual Worldwide Candle Lighting share a message to our memorial wall in memory of your child, grandchild, or sibling. Sharing to the memorial wall will be available until Wednesday 6:00 pm (EST), December 13th. and the huge stone Congregational Church. NORAH’S PLACE is a beautiful Victorian yellow house. with a ‘statue’ of a horse and buggy in front. All chapter members, their families and friends are invited to attend. Unlike our meetings, we do not limit age. If you have a young one who you feel could participate, they, too, are welcomed. but would like to become part of the gathering. Those attending our chapter’s candle lighting are asked to bring an item or two to contribute to our Pot Luck Supper, Snacks and Desserts. We will be running a slide show presentation of all of our loved ones. Photos can be submitted electronically by emailing them to Bettie-Jeanne at TCFEastOfTheRiverCT@gmail.com before midnight December 7. If you’d like, share a few words about your child’s or sibling’ life; their likes or dislikes, what made them laugh, what made them special. If you have a poem or reading that you would like to contribute, please email also (or bring it with you). This is NOT a Holiday Party ~ But there will be holiday decorations. It is an informal, caring gathering, of “like-hearted” families who understand the challenges faced not only at this time of year, but all the days of our lives. 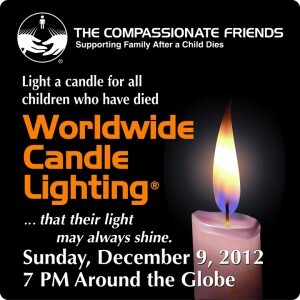 We are planning a pot luck dinner before the candle lighting with desserts and snacks after the candle lighting. Entries, Appetizers, Desserts, Salads, Beverages are all appreciated, but are not necessary to be able to attend. Anything else that you would like us to know or wish to share with us? I don’t have words to describe the emotion that enveloped me at all of our at The Compassionate Friends National Conferences. Each time, there I stood, shoulder to shoulder, heart to heart with 1,500+ other bereaved moms, dads, and siblings. Each year, in a light originating from a single flame, until the glow enveloped the hall, we lit candles, one from the other, in memory of our loved ones. As the flame was passed, we were recipients of the gift of the child’s name who brought light to our dark candle. Then Jim and I proudly spoke our RobynApril’s name as we gave light to the candle next to us, and heard, in return, their own beloved one’s name. I have lit candles at home for our daughter and taken comfort from the connection that was felt. But there was something deeper, more meaningful, when I stood among others who knew my heartache because of living their own. below the glow of the lights, and without a word exchanged, we felt deeply connected in the moment. We were Robyn’s parents, together; each living the experience of her death alone, and yet sharing the deep loss, together, as her family. Sharing a Candle Lighting with other bereaved parents, siblings, grandparents, friends, family is Profound, Intimate, Important. at any age from pre-birth to full maturity. as the observance continues around the world. our TCF East Of the River CT Chapter chooses to join the world’s largest candle lighting at the private home of one of members. All chapter members, their families and friends are invited to attend. Unlike our meetings, we do not limit age. If you have a young one who you feel could participate, they, too, are welcomed. Also welcome are any bereaved parents, grandparents and siblings who may have never attended or can not attend a TCF EOTR CT Chapter meeting, but would like to become part of the gathering. Those attending our chapter’s candle lighting are asked to bring an item or two to contribute to our Pot Luck Supper, Snacks and Desserts. We will be running a slide show presentation of all of our ‘children’. Photos can be submitted electronically by emailing them to Bettie-Jeanne at TCFEastOfTheRiverCT@gmail.com before midnight December 7. If you’d like, share a few words about your child’s or sibling’ life; their likes or dislikes, what made them laugh, what made them special. If you have a poem or reading that you would like to contribute, please email also (or bring it with you). This is NOT a Holiday Party ~ There will be no holiday decorations. It is an informal, caring gathering, rather like our Vernon Diner Breakfasts and After Meeting Get-togethers of “like-hearted” families who understand the challenges faced not only at this time of year, but all the days of our lives. I have lit candles at home for our daughter and taken comfort from the connection that was felt. But there was something deeper, more meaningful, when I stood among others who knew my heartache because of living their own. below the glow of the lights, and without a word exchanged, we felt deeply connected in the moment. We were Robyn’s parents, together; each living the experience of her death alone, and yet sharing the deep loss, together, as her family. Sharing a Candle Lighting with other bereaved parents, siblings, grandparents, friends, family is Profound, Intimate, Important. 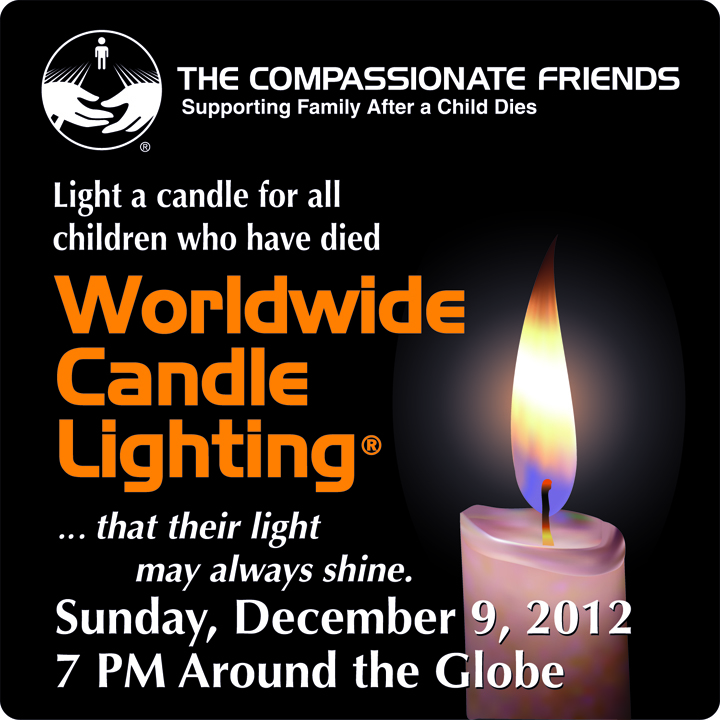 For the past 17 years, The Compassionate Friends has hosted a Worldwide Candle Lighting that reaches across the globe like a sea of brightness, uniting family and friends who light candles for one hour to honor to remember children who have died from any cause, at any age from pre-birth to full maturity. As candles burn down in one time zone, they are then lit in the next, creating a virtual 24-hour wave of light as the observance continues around the world. To provide for intimacy and a “homey” atmosphere, our TCF East Of the River CT Chapter chooses to join the world’s largest candle lighting at the private home of one of members. I don’t have words to describe the emotion that enveloped me these past three summers at The Compassionate Friends National Conferences. Each time, there I stood, shoulder to shoulder, heart to heart with 1,500+ other bereaved moms, dads, and siblings. In a light originating from a single flame, until the glow enveloped the hall, we lit candles, one from the other, in memory of our loved ones. As the flame was passed, we were recipients of the gift of the child’s name who brought light to our dark candle. Then Jim and I proudly spoke our RobynApril’s name as we gave light to the candle next to us, and heard, in return, their own beloved one’s name. I have lit candles at home for our daughter and taken comfort from the connection that was felt. But there was something deeper, more meaningful, when I stood among others who knew my heartache because of living their own. At that moment, eyes locked, Jim and I reached for each other’s hands below the glow of the lights, and without a word exchanged, we felt deeply connected in the moment. We were Robyn’s parents, together; each living the experience of her death alone, and yet sharing the deep loss, together, as her family. Sharing a Candle Lighting with other bereaved parents, siblings, grandparents, friends, family is Profound, Intimate, Important. 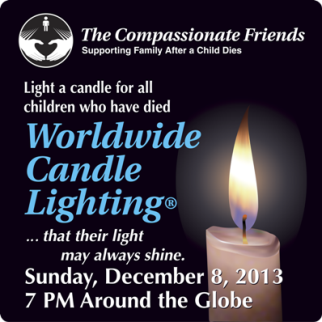 For the past 16 years, The Compassionate Friends has hosted a Worldwide Candle Lighting that reaches across the globe like a sea of brightness, uniting family and friends who light candles for one hour to honor to remember children who have died from any cause, at any age from pre-birth to full maturity. As candles burn down in one time zone, they are then lit in the next, creating a virtual 24-hour wave of light as the observance continues around the world. All chapter members, their families and friends are invited to attend. Also welcome are any bereaved parents, grandparents and siblings who may have never attended a TCF EOTR CT Chapter meeting, but would like to become part of the gathering. Those attending our chapter’s candle lighting are asked to bring an item or two to contribute to our Pot Luck Supper, Snacks and Desserts. We will be running a slide show presentation of all of our ‘children’. Photos can be submitted electronically by emailing them to Bettie-Jeanne at TCFEastOfTheRiverCT@gmail.com Share a few words about your child’s or sibling’ life; their likes or dislikes, what made them laugh, what made them special. If you have a poem or reading that you would like to contribute, please email also. This is NOT a Holiday Party ~ But because of the younger children who share the home, visitors should anticipate Christmas decorations. It is a caring gathering, rather like our Vernon Diner Breakfasts and After Meeting Get-togethers of “like-hearted” families who understand the challenges faced not only at this time of year, but all the days of our lives.